For over twenty years Monte Conero is half of Mountain Bike enthusiasts – Mtb. Despite its limited altitude, the Conero has nothing to envy to the famous Ligurian resorts and thanks to its geological formation, allows us to have trails of multiple difficulties and slopes, leaving everyone, more or less experienced, the opportunity to enjoy the its breathtaking views, the cliffs overlooking the sea and the fantastic Mediterranean woods. Moreover, with the introduction of the Conerostyle school equipment of the electric Mtb, the physical form and the technique will no longer be a problem, everyone will be able to discover this beautiful promontory in a fun, alternative and effortless way. Find out in the section below the services that the Conerostyle school can offer you for Mountain Bike in the Conero Riviera at the Portonovo and Marcelli offices. 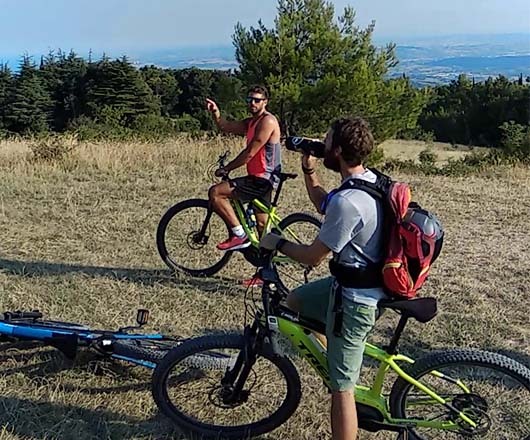 You can therefore take part in the excursions in Monte Conero either by yourself or by hiring one of our E-bikes at a Conerostyle center. For your safety we offer you the helmet as equipment and of course we suggest a suitable clothing to face the best routes. Conerostyle School will therefore provide everything you need to face your excursion in complete safety; You will be followed by our FCI guides and teachers, starting from the most suitable adjustment of the bike to the driving technique to face the best climbs and descents, without neglecting historical-cultural hints of the area. All this will make your excursion an unforgettable experience. The reservation for Mountain Bike excursions is available at the headquarters of: Portonovo and Marcelli. We have packaged several tours suitable both for beginners and experts, suitable for both muscular and pedal assisted MTB (E-MTB). Our TOURs have three different levels of difficulty: Basic, Intermediate and Advanced. It will also be possible to implement the paths to be covered in the excursion and therefore extend the duration of the tour starting from 3h basis. For additional information, please contact us and together we will find the proposal that best suits your needs and preferences. The minimum number of participants to guarantee the excursion is 4 people, the maximum number is 10 people. Booking for excursions is available at our offices in Portonovo and Marcelli or by contacting us by phone numbers in the “Contact” section. * The indicated participation fee includes the membership for the current season at ASD Conerostyle. The bike that we provide for hire is the model TREK Powerfly 5, (see the equipment in our Centers) a versatile and very easy to drive that will allow you to tackle both road routes and dirt paths also challenging thanks to the front suspension and to the geometry of the frame. Thanks to the pedal assisted by the powerful Bosch electric motor, you will be able to easily overcome even the most difficult climbs with extreme ease. It is advisable to book the bike by 19:00 the previous day. The rental of equipment for the MTB activity is available at the offices of: Portonovo and Marcelli. For any information contact us by phone at 393.4876607, leave us a whatsapp or fill out the form below and we’ll get back to you right away.